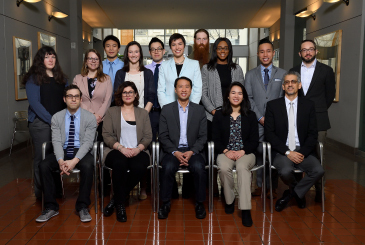 The Cochlear Center for Hearing and Public Health draws on the diverse expertise of its faculty members and trainees from a broad array of disciplines in order to advance a global understanding of hearing and its impact on overall patient health. Please select each team member below for a brief summary of their work. Osama Tarabichi, MD, received his medical degree with honors from the Royal College of Surgeons in Ireland, Medical University of Bahrain, and developed an interest in hearing sciences in medical school. After graduation, he joined the auditory brainstem implant laboratory at Harvard Medical school for a two-year research fellowship. He has a special interest in improving access to cochlear implants in third-world countries, and serves as the secretary of the Global Cochlear Implant Access Network (GCIAN). With a scholarship from the Cochlear Center, he will pursue an MPH at the Johns Hopkins Bloomberg School of Public Health as a member of the class of 2019. Nicole Armstrong, PhD, is a postdoctoral fellow in the Laboratory of Behavioral Neuroscience at the National Institute on Aging (NIA) and is mentored by NIA senior investigator Susan Resnick and Cochlear Center director Frank Lin. She received her PhD in epidemiology from Johns Hopkins Bloomberg School of Public Health in 2017. Her interests are in cognitive aging, and mechanisms underlying the associations of risk factors, such as sensory loss, with cognitive decline and dementia. Michael Yong, MD, is a resident physician in Otolaryngology-Head and Neck Surgery at Johns Hopkins University School of Medicine from the University of British Columbia. Through the support of the Clinician Investigator Program research fellowship, funded by the Royal College of Physicians and Surgeons of Canada, he is pursuing the Master of Public Health/Master of Business Administration dual degree at Johns Hopkins University. His research interests include pediatric and age-related hearing loss, health interventions in underserved communities and cost-efficiency analyses of health systems. Jonathan J. Suen, AuD, is a research fellow with the Center on Aging and Health at the Johns Hopkins University School of Medicine. Under the mentorship of Cochlear Center director Frank Lin, he works to integrate public health frameworks and research methods with clinical audiologic practices in studying community-based initiatives for accessible hearing care for older adults. He received his clinical doctorate in audiology from Gallaudet University in 2016. He is interested in investigating innovative delivery models of care for achieving hearing health equity. Perry Kuo is a physician from Taiwan and currently a PhD student in Epidemiology with a focus on aging at Johns Hopkins Bloomberg School of Public Health. His research interests include investigating potential modifiable risk factors for age-related hearing loss, evaluating the effect of hearing loss on physical activity and physical functions and assessing the impact of hearing aids on physical activities and physical functions. Pablo Martinez Amezcua, MD, received his medical degree from the National Autonomous University of Mexico and is a doctoral student in the Department of Epidemiology at Johns Hopkins Bloomberg School of Public Health. He is interested in studying social determinants of health, physical activity and prevention of diseases associated with age such as hearing loss, cardiovascular disease and mobility disability. James Ting is a medical student at Johns Hopkins University School of Medicine. He completed his degree in Biomedical Engineering and is interested in studying the association of hearing loss, dementia and cardiovascular disease. Danielle Powell, AuD, is a doctoral student in Epidemiology at the Johns Hopkins Bloomberg School of Public Health. Prior to starting the program, she worked as an audiologist in the Washington, D.C., area. She received her Doctorate of Audiology from the University of North Carolina in 2013. Her research interests include the association of hearing loss with dementia, and healthy aging..
Alan Shan is a third-year medical student at Johns Hopkins University School of Medicine and plans to pursue a career in otolaryngology. He will be taking a year off from medical school to pursue research at the Center from 2018-2019. Aishwarya Shukla is a student at the Johns Hopkins University School of Medicine who hopes to train as an otolaryngologist head and neck surgeon. She became interested in hearing loss research after learning about the profound effect that hearing loss can have on the quality of life of patients. Her current research focuses on developing interventions to improve communication between physicians and patients who have hearing loss. Prospective applicants are encouraged to reach out to Jennifer Deal prior to submitting any materials. Materials should be submitted via email to Shannon Smitherman, Academic Program Coordinator, hearingsph@jhu.edu. Contact Shannon Smitherman with questions about submission procedures at 443-287-7779 or hearingsph@jhu.edu.